›What Russia stands to lose in Venezuela? What Russia stands to lose in Venezuela? 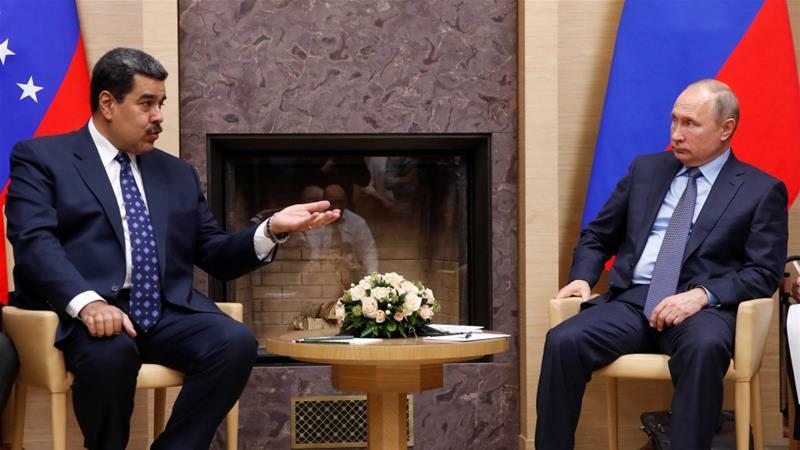 While the US pushes to drive Venezuela's Maduro from power, Russia vows to continue supporting 'strategic partner'. As Washington intensifies its push to drive Venezuela's President Nicolas Maduro from power, Russia's Vladimir Putin has vowed to support his South American "strategic partner" and warned of the "catastrophic" consequences if the US were to send military assistance to opposition leader Juan Guaido. When the United States called a special United Nations Security Council session on Saturday, focused on the crisis in Venezuela, Russia used the session to warn against foreign intervention in the Latin American nation and accused the US of attempting a "coup". Vladimir Rouvinski, a foreign policy expert at Icesi University in Colombia, told Al Jazeera that the Kremlin views Venezuela as the backyard of the US - in Washington's sphere of political influence - in the same way that Ukraine is in Russia's backyard - or what the Kremlin calls - "the near-abroad". External observers typically view Cuba as Russia's key Latin American ally, but Rouvinski said Russia has never managed to restore the same level as confidence in Havana as in Soviet times. Putin found an ally in Venezuela. The late Chavez, and now Maduro have shared Putin's worldview, opposed to US hegemony. Under the administration of President George W Bush beginning in 2001, Chavez became highly critical of Washington's "imperialistic" foreign policy in the Middle East including the invasion of Iraq. In 2015, Caracas and Washington relations hit rock bottom when former President Barack Obama issued an executive order, declaring Venezuela a "threat to US national security" and ordered sanctions against seven Venezuelan officials. Former special rapporteur Alfred de Zayas, who visited Venezuela over a period of 21 years has criticised the US sanctions, describing them as "economic warfare" that aims to strangle the economy and facilitate regime change. The Russian gas giant currently resells approximately 225,000 barrels per day of Venezuelan oil - about 13 percent of the nation's total exports, according to the PDVSA trade reports. But Russia never expected to make tangible profits in Venezuela, according to Ravnitski. The collapse of Maduro's government would have a far greater political significance than an economic importance for Moscow. "Without his support, the opposition would have a much easier time taking power," said Rouvinski.